Introducing our manufacturing process of high quality vacuum glass liner. Tiger Corporation aims to be a company that will continue for 100 or 200 years based on our new corporate beliefs. Since Tiger Corporation was founded in 1923, we have continued to deliver accessible household products for daily living. It all started with glass vacuum bottles and went on to expand to rice cookers, electric water heaters, and other cooking appliances. Since then, with the strength of our vacuum insulation technology and creative products which first capture the needs of customers, we have been able to deliver convenience and comfort to a variety of every day scenarios. In 2012, Tiger Corporation formulated our new Corporate Beliefs. With our mission of “We will continue to create new every day essentials for the dining experience with ideas that produce warmth.” We aim to become a company that will continue to grow for 100 or 200 years. As globalization progresses, we have established sales bases in Shanghai, Hong Kong, Taiwan, and the U.S.A. In addition to our production base in Shanghai, we will open a new factory in Vietnam in 2012. As we make steady progress, we strive to spread joyous harmony throughout the world. 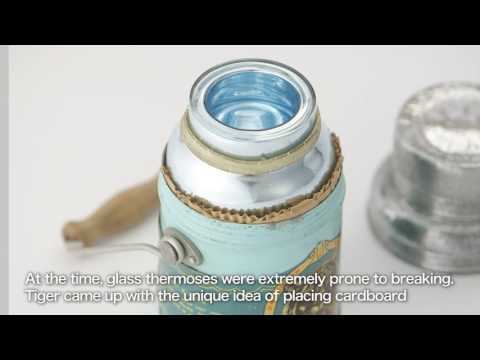 The vacuum bottle, which is the origin on which this company was founded, is a product that not only functions to keep drinks warm; it plays the role of magic tool that warms the hearts of those who drink from it. Even though the times may change, our resolve remains the same. Tiger Corporation will always continue to help put smiles on peoples’ faces so they can share their smiles with others, which will help people create sophisticated and comfortable lifestyles. We hope you continue to enjoy life with Tiger products and we look forward to your continued support in the future. The start of Tiger Corporation’s history was our founder wanting everyone to be able to enjoy the warmth of a cup of hot tea just like mom made, at any time they like. Company founder Takenori Kikuchi founded Kikuchi Manufacturing Company in Osaka City and started the manufacture and sales of Tiger brand vacuum bottles. The Head Ofﬁce and factory were combined and moved to Taisho Ward, Osaka. The Tokyo Ofﬁce was established. The company name was changed to Tiger Vacuum Bottle Ind., Co., Ltd. The Head Ofﬁce and factory were moved to Joto Ward, Osaka, and the production system was enhanced. Tiger was the ﬁrst factory in the industry to be designated as a Japanese Industrial Standards (JIS) accredited factory by the Ministry of Trade and Industry (MITI) (currently the Ministry of Economy, Trade and Industry [METI]). A new, integrated factory was completed in Kadoma City, Osaka (the current location). Tiger was designated as a quality control model factory by the Osaka Prefectural Government. Tiger installed an automated vacuum bottle manufacturing system. The automated vacuum bottle factory and product warehouse were completed. On the 45th anniversary of the founding of the company, Takenori Kikuchi was appointed chairman and Yoshito Kikuchi was appointed president. Tiger completed a new building (Building No.2) and a new factory. The Tiger Products Co., Ltd. Tohoku Sales Ofﬁce was opened. The Tiger Bussan Co., Ltd. Hiroshima Sales Ofﬁce was opened. Tiger completed a new Head Ofﬁce building (Building No.3) and factory. The Head Ofﬁce Distribution Center was completed. Tiger celebrated its 60th anniversary. The company name was changed to Tiger Vacuum Bottle Co., Ltd. The Kadoma Vacuum Bottle Center was completed. A CAD system was installed. The Tosu Distribution Center was completed. The stainless steel vacuum bottle metal pressing factory was completed at the Kadoma Vacuum Bottle Center. The Tiger Production Control System (TOPICS) was installed. An online sales and distribution system (TOPS) was installed. 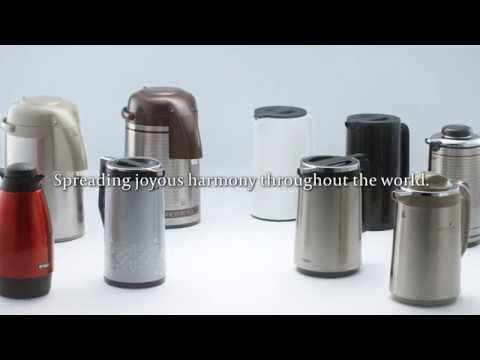 Tiger established Tiger Vacuum Bottle, Taiwan Co., Ltd., a joint venture company in Taiwan. Tiger merged Tiger Bussan Co., Ltd. and Tiger Products Co., Ltd. to create a nationally uniﬁed sales division, and established Tiger Hanbai (H.K.) Co., Limited. The molding plant building was completed at the Head Ofﬁce site. The Eastern Japan Distribution Center was completed. Shanghai Tiger-born Electronic & Electrical Appliance Limited, a joint venture company, was established in Shanghai. 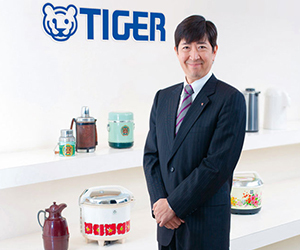 Tiger merged with and absorbed Tiger Products Co., Ltd. Yoshisato Kikuchi was appointed president. The Head Ofﬁce Factory received ISO 9001 certiﬁcation. Japan Tiger Corporation of U.S.A was established in America. Tiger merged with and absorbed Tiger S Net. Tiger established Tiger Technical Services. TIGER VIETNAM Co., Ltd. was established in Vietnam.